The Memory and Alzheimer's Treatment Center is a collaborative partnership between the departments of psychiatry, neurology, and geriatric medicine that offers comprehensive evaluation and innovative treatment to patients with a range of conditions that affect cognition and memory, including Alzheimer's disease and other dementias, traumatic brain injury, and brain vascular disease. Our expert team of specially trained physicians and nurses uses innovative, nationally recognized model of care developed here at Hopkins. Using diagnostic and treatment advances, patients are provided with a thorough assessment, diagnosis, and comprehensive treatment, as well as counseling, education and guidance for family caregivers. Based at The Johns Hopkins Bayview Medical Campus, the Center and its physicians treat thousands of patients annually in outpatient, inpatient, and outreach settings. In addition to inpatient care and the outpatient clinic at Bayview, care is coordinated with sub-specialty clinics such as the Neuropsychiatry and Memory Clinic and the Frontotemporal and Young Onset Dementias Clinic at The Johns Hopkins Hospital in East Baltimore. Patient care is integrated with research to develop new treatments for Alzheimer’s and other dementias, and with training programs for the lay public, physicians, specialists, other clinicians and researchers in the field. We hope you find the information on our web pages helpful but please do not hesitate to call us. Kathy Siggins (third from right photograph at top) initiated the Alzheimer’s disease semi-postal stamp to raise public awareness and funding for Alzheimer's research. 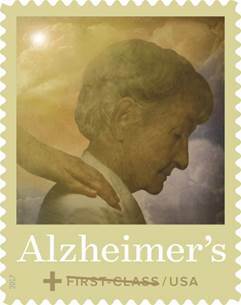 Since its release in November 2017, the US Postal Service has sold 5.1 million stamps raising over $726,000 with the proceeds going to the Department of Health and Human Services to fund Alzheimer’s disease research. The stamp, by artist Matt Mahurin, costs 65 cents, which includes the rate of first-class, single piece mail, plus an amount to fund AD research at the National Institutes of Health (NIH). It is available through 2019. Dr. Jin Hui Joo researches and develops programs that decrease barriers and engage minority older adults in depression care.